Here is a compilation of timely disease tips based on observations in the fields this week. Stem clipping from a field this week. Blackleg is pretty severe in some of them. Got blackleg? Blackleg is out there. If average severity is moving beyond 1.5 toward 2 or more, this is a clear sign that the blackleg resistance in the variety is no longer appropriate for this particular field. The blackleg pathogen population has shifted and R-gene rotation will be required the next time canola is grown on that field – unless the plan is to take a three-year break from canola. New tests allow farmers to identify the blackleg races in their fields. With this information, farmers can choose canola varieties with resistance to those races. Read more on blackleg tests and labs. 8 diseases to scout for at harvest. Diseases are usually easiest to see and diagnose in the couple of weeks before swath timing. Patches of dying or prematurely-ripening plants are obvious areas to scout (and show up really well with drone images), but even clean-looking fields can provide some early warning if you take time to look. Read more on the 8 diseases and how to identify them. Post-harvest scouting for verticillium and more. Verticillium is one disease that can be more obvious and easier to identify after cutting a canola crop. As the plant dies, verticillium microsclerotia — if present — will start to grow under the stem’s skin. Read more. Soil tests for clubroot. Soil tests to determine if a field has clubroot could be done with just one or two composite samples taken from high-risk areas – like the field entrance or a water run that may bring spores into the field. Labs that do clubroot testing. Check plants for clubroot. During harvest scouting, carefully examine the roots of unhealthy looking plants and also random plants chosen from around the field. Start in high risk areas, such as field approaches, then fan out through the field in a “W” pattern. By this time of year, galls may start to break-down. Decaying galls will have a sawdust-like look and texture. If in doubt, send plant samples to a lab for identification. How to scout. Clubroot and your 2019 seed decision. As we learned at the International Clubroot Workshop, genetic resistance to clubroot is failing at an increasing rate all around the world. 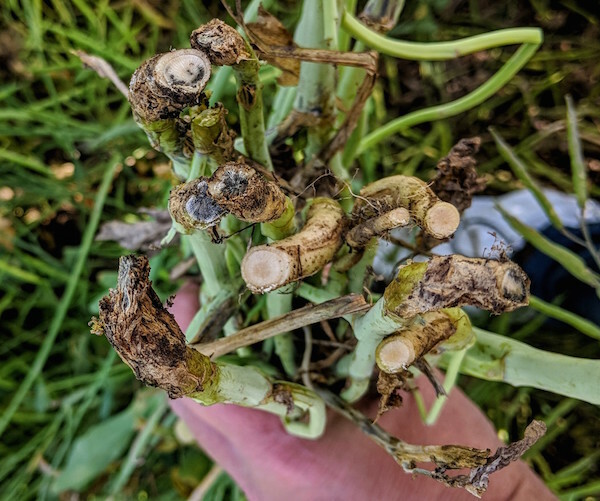 To help reduce selection pressure for clubroot pathotypes that can overcome the current resistance traits, the Canadian approach is to deploy clubroot-resistant (CR) canola seed varieties as soon as clubroot is seen in an area and to use CR varieties in an extended rotation. Read more.